I am often asked which rosé wines from Provence I would recommend, so I have put together some which I liked at recent tastings. 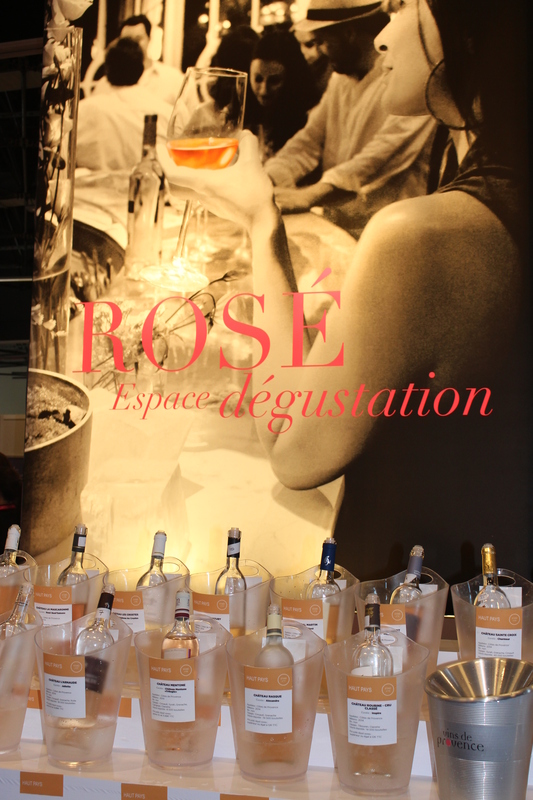 The wines were tasted at various domaines, the large trade fair Prowein in Dusseldorf and the annual Côtes de Provence tasting in Mandelieu, both this month, March 2015. 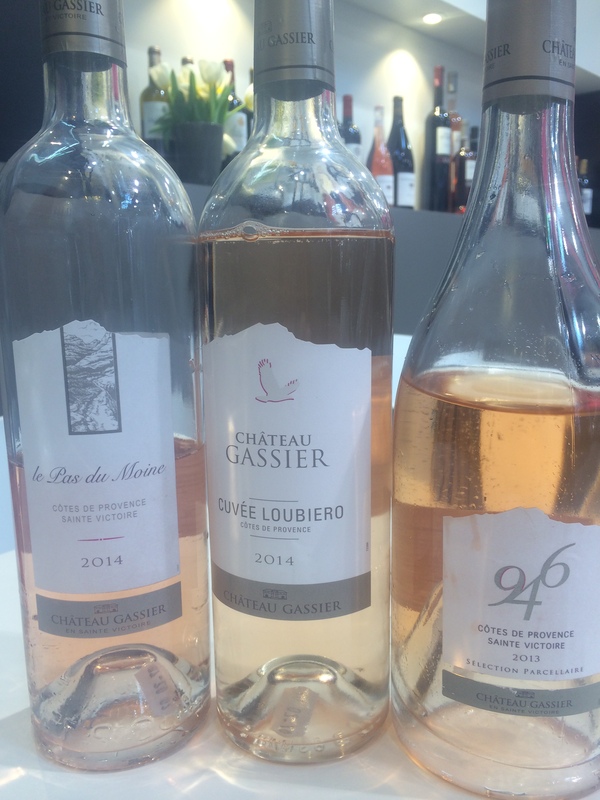 I tasted 77 rosés released for 2015 (almost all from the 2014 vintage); 46 stood out as being of interest. This is by no means an exhaustive list, and I did not taste all of the wines available at either Prowein or at Mandelieu. With over 600 rosés made in Provence (and making up 90% of the region’s wine production), this survey barely scratches the surface. Fresh, crisp red fruit, and good acidity. This group was the largest. Red fruit with rounder more complex structure. Black and red fruit, rounder, balanced acidity. Softer peachy, apricot fruit, creamy body and good acidity (interestingly all including Cinsault and all but one from the hotter central Valley). More mineral, salty, structured, austere and mouth-watering. Within some of these groups, some wines included older vines, more elaborate wine-making including lees stirring (battonage) and wood ageing, but on the whole these ‘extras’, reserved for the premium wines, were very subtle and only evident in their greater weight and intensity. 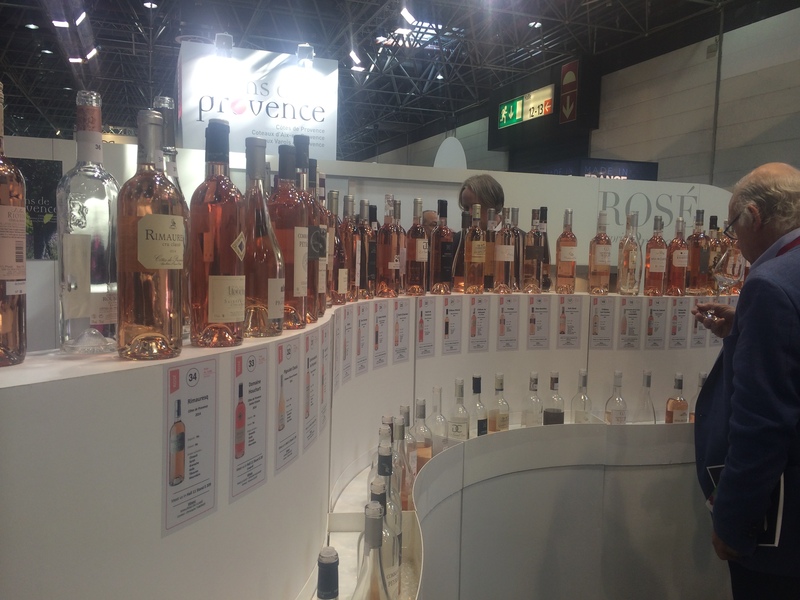 There is a definite growth in the number of premium rosés, with one producer telling me that for the first time at Prowein, a German buyer came specifically looking for premium rosé. Grenache remains the grape variety for the majority of rosés, with the other traditional grapes of the region for rosé: Cinsault, Tibouren and occasionally Carignan. The blacker grapes – Mourvedre, Syrah and Cabernet Sauvignon tend to, but not always, give extra depth of fruit and more black fruit character, as well as greater structure. The white grape varieties Rolle, Ugni Blanc and Grenache Blanc are occasionally added but only in very small quantities. Individual winemaking styles certainly dictate the final style of wine. The appellations covered in these tastings include Côtes de Provence, Côtes de Provence-La Londe, Côtes de Provence-Ste Victoire, Côtes de Provence-Frèjus and Côtes de Provence-Pierrefeu, with a few from Côteaux Varois-en-Provence and Côteaux d’Aix. There are regional variations. The hotter inland valleys produce classic dry rosés. The limestone soils of Ste Victoire provide freshness and acidity. The volcanic soils of the coastal ranges of the Maures and Estérel and Fréjus give structure. The coast around La Londe gives minerality and acidity. The so-called ‘golden triangle’ around Pierrefeu produces wines with a stone-flint structure. The wines of these last three regions (Fréjus, La Londe and Pierrefeu) certainly stood out as having greater minerality, stoniness and austere salty structure. The wines which did not make my selection, either lacked fruit, had boiled sweet fruit, lacked acidity, lacked charm or almost made it only to be let down by a hint of bitterness on the finish. Some rosés showed badly because they had only been bottled the week before and were ‘closed’, showing no fruit character on nose or palate, and will need to be re-tasted when they have settled down. In no particular order of preference, but in order of style, here is my list for my favourite rosé wines from round one. Wines with no appellation indicated are AC Côtes de Provence. Maitres Vignerons de St Tropez Elixir; Domaine Gavoty Clarendon; Domaine la Goujonne Gamali; Domaine Clos d’Alari Grand Clos; Domaine Clos d’Ours Grizzly; Domaine l’Escarelle Mes Bastides, AC Côteaux Varois; Domaine Longue Tubi; Domaine Rabiega La Cuvéé Rose; Chateau Font du Broc; Chateau Gassier Cuvée Loubiero; Chateau Gassier Pas de Moine, AC Ste Victoire; Henri Bonnaud Step IGP; Henri Bonnaud Terre Promise; Mas de Cadenet Arbaude; Domaine du Noyer Clos Mistinguett; Domaine du Noyer Le Grand Noyer; Domaine du Noyer La Reserve de Mistinguett; Chateau du Rouet Esterel; Domaine du Noyer Clos Mistinguett La Reserve de Mistinguett; Ferry Lacombe Haedus, AC Ste Victoire; Chateau du Rouet Belle Poule. Domaine Rabiega Clos d’Iere; Domaine Valette Hautes Restanques; Chateau Leoube Le Secret de Leoube, AC La Londe; Mas de Cadenet Negrel, AC Ste Victoire; Mas de Cadenet, AC Ste Victoire; Chateau Gassier 946 (2013), AC Ste Victoire. Chateau Roubine Terre de Croix; Domaine de la Croix Irrestible; Domaine Pigoudet la Chapelle, AC Coteaux d’Aix; Henri Bonnaud AC Ste Victoire; Henri Bonnaud, AC Palette; Domaine de Valcolombe White Label, AC Côteaux Varois. Domaine l’Amaurigue Fleur de l’Amaurigue; Domaine de la Bastide Neuve Perle des Anges; Chateau de St Martin Eternelle Favorite; Domaine de Valcolombe Black Label, AC Côteaux Varois (with a hint of red fruit). Domaine des Sarrins Grande Cuvée; Chateau Roubine Inspire; Domaine Estandon Heritage; Domaine Eole, AC Côteaux d’Aix; Hecht & Banner, AC Côteaux d’Aix; Chateau Montaud, AC Pierrefeu; Domaine de la Sangliere Signature, AC La Londe; Chateau de Bormettes, AC La Londe; Chateau du Galoupet, AC La Londe; Chateau Malherbe Malherbe; Chateau de Rouet, AC Frèjus. 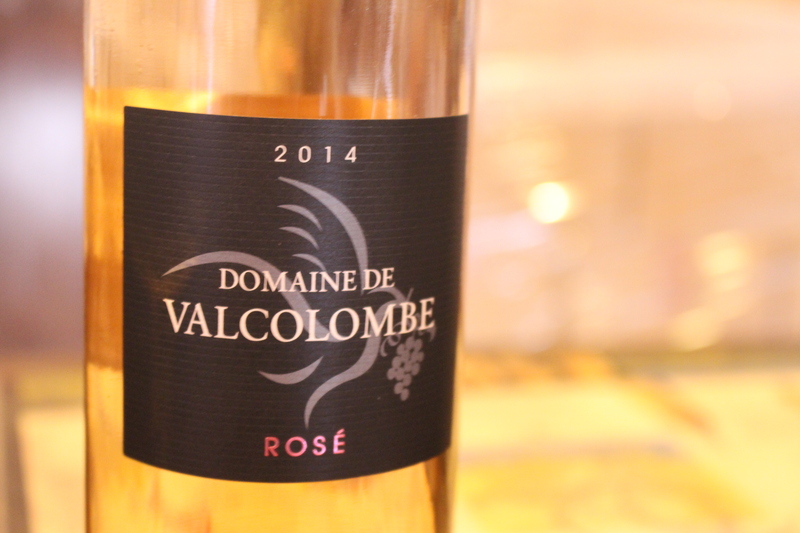 On the whole, shortage of acidity was not a problem for Provence rosés from the 2014 vintage; all had good acidity. The wines which did stand out were those which balanced the fresh acidity with sufficient fruit, weight, a touch of added complexity (giving the wines a chance to last longer than just the summer season) and, most importantly, had charm. Pink wine with acidity is not enough. I have found that the more mineral wines often do less well in blind tastings, but shine when served with food. Good rosé wines range from being pretty and charming to fresh and fruity through to mouthwatering minerality. No single clear style emerged of Provence rosé, a conclusion I came to when summing up Decanter Magazine’s Provence Rosé tasting last year. This highlights the need to be aware of the different styles when evaluating these wines. NB I have only tasted a small selection of the wines available – I will be continuing with my tasting. This list is not meant to be a definitive guide. Prices were not taken into account in my evaluations.